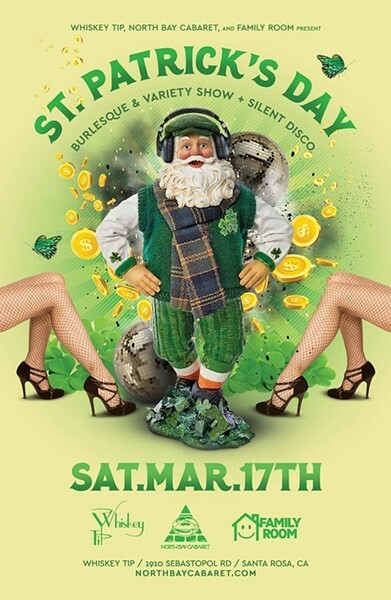 There may not be a literal rainbow pointing to the Whiskey Tip in Santa Rosa this weekend, but those who come to the St Patrick's Day variety show with North Bay Cabaret will feel like they won the jackpot. The variety of entertainment includes burlesque performers, live music from Big Kitty and Oddjob Ensemble’s Kalei Yamanoha, standup comedy, fire performers, DJs spinning late into the night and more. There will also be St. Patrick’s Day drinks and dinner options, and a raffle will raise funds for North Bay fire relief. Saturday, March 17, at Whiskey Tip, 1910 Sebastopol Road, Santa Rosa. 7pm. $20–$25. 707.843.5535.